RetroRetrospective – Fun today with yesterday’s gear…….. Thinking about the issues I had with setting up my KryoFlux USB FDD controller on my venerable Power Mac QuickSilver 2002, got me cogitating over the “How old is Retro?” argument. Many say the rule-of-thumb is 10 years. 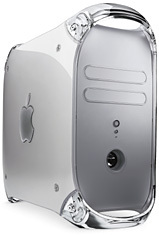 On that basis, my QS2002 qualifies as the QS2002 range was released January 2002 as an update to the previous QuickSilver Power Macs, and ended July 2002, and then replaced by the “Mirror Door” series. but . . . . . . This is still a usable system, and that I still use for Final Cut Studio (originally FCP 3.0 and DVDSP 1.5) and general work. Does that mean that we need to look at the OS? It originally came with MOS 9.2.2 – now that puts it in the “Ye olde OS category “, but it also came with OS X 10.1.2, and that can be upgraded all the way to 10.5.8, which is a similar age to XP, but far far better (IMHO). Is the current maximum OS supported by Apple? Sort of. Although I haven’t seen an update (security, or otherwise) for quite a while, the software update server at Apple will still acknowledge its existence, and supply program and OS updates as required, and of course I have all my OS and program updates squirreled away in preparedness of that inevitable day when Apple turns off the update servers, as they have for 10.3, and earlier (Software Update no longer available in Mac OS X v10.3 and earlier). So, here we sit on the border of current vs retro, and for now I’ll just say it’s my favourite Mac, and that is more retro than not, but not quite all the way. Here are the Xbench results for the original IDE drive, the 500GB SATA, and the OWC SSD: Both the 500GB and OWC 60GB are running off the SATA controller I added to increase the online storage options. Pingback:What's the oldest Mac you still continually use and what do you use it for?